I’ve known Pete York and Miller Anderson since the late 60s. Several early DP tours were with Hardin/York and we’ve often met from time to time since then. 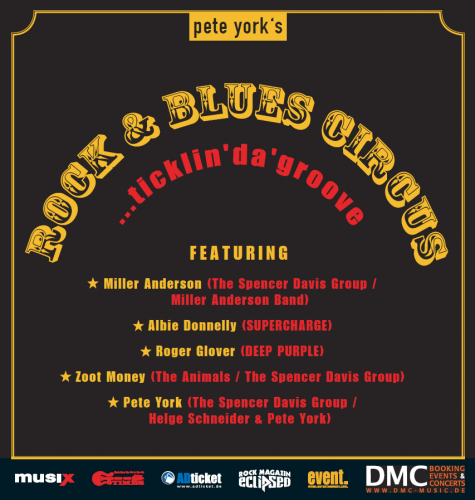 Over the years, Pete has organized lots of these special events, featuring a phalanx of great musicians. In 1970, Ian Paice, Miller and I took part in Pete’s first one (I still have the poster advertising “Super Drumming” at Bumper’s Club in London). Posted by Nick Soveiko on Tuesday, July 17th, 2018, filed under News. You can follow comment on this post through the RSS 2.0 feed. You can skip to the end and leave a comment. Pinging is currently not allowed. It’s all so confusing to me anymore!